Before taking my first listen to Life in Surveillance, as a stranger to the band I deemed it only polite to do my homework. So They Say is a rock band, a quartet, hailing from St. Louis, Missouri. They signed with Fearless in 2005, released their debut in 2006. They were met with much acclaim and toured with Atreyu. Huh. Thus came the introduction of palm to forehead. Bit of a bubble burster for a newcomer to the band, wouldnt you say? But still, much acclaim. Ill try my best to refrain from any journalistic humor as pertaining to the bands name. Opener Just Forget My Name picks up with a brain-rattling mesh of riffs and tight drumming that is nothing less than rousing. The vocals enter on cue and much to my disillusionment, everything starts to slide south. Although vocalist/guitarist David Schroeder has a voice noticeably similar to that of The Useds Bert McCracken, its the way the vocals give indistinct shape to the songs that starts to paint a dour picture of the music. Second track These Nights Are Long is more of the same but on a marginally positive scale; an Atreyu-esque song with a decent chorus of The nights are long as long as I think of you. With first single Wake Me Up were treated to more of the same - the fast part with the high-end riffing, the calmer part with the reverb, the group chorus - and affirmation starts to sink in of what this record is all about. The whole thing is incredibly close to nu-metal. I dont really know how to describe it otherwise. Eschewing brevity, its music for teenage boys to listen to in their bedrooms when pissed at nothing in particular, relating to lyrics with all the impact of a Nerf dart; a limbo of barrenness between angst and rage. Harsh words maybe, but Life in Surveillance paints itself as an exemplary target. So They Say carry the same kind of exciting blandness as Enter Shikari but without the ability to define themselves through ridiculous clothing and glowsticks. Four songs in, noticeably, the hyper-produced vocals begin to hurt, as does the predictability of the traffic-jam riffing. Its a formula that has, in degrees, worked for various acts, but therein lies the problem. Its a confused sound that makes it difficult to differentiate between the songs and difficult to want to. Admittedly, some parts of the record are entirely successful in nurturing movement in my head and hope in my deposits of unspent rock. Youre Welcome is a blistering track with an infectious if unchallenging The Used-esque chorus. This is more like it, and the lack of sappiness or underpinned pandering is a blessing; this last point in particular giving the band a brownie point or two, never stooping to the level of a number of MySpace-led acts I wont give the pleasure of the namedrop. 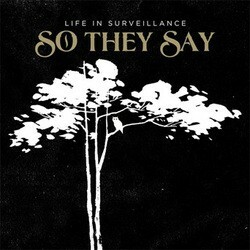 For So They Say, it seems that just around the corner is something that resembles an anthem; somewhere between the attack that the band musters and the initiative that it doesnt quite. The Hand of God is a perfect example; the tightly clenched core riff reconciled with an explosion of euphoria at the chorus. Regardless, the song is awkward, once again feeling five years too late. Living life like a rolling stone, that dont know which way it should roll. Any way but backwards, maybe. Life in Surveillance: wishful thinking? Perhaps not - Alternative Press said about the band, You cant help but be reeled in by their infectious sincerity. I cant help but wish that were true. So They Say is a band that needs to find its own sound and its own soul, without which it can barely hope to endure. 3.0 / 10 — M.J.
Posted Jan. 22, 2008, 4:20 p.m.